First Look: The Replacer from AfterShock Comics – AiPT! A bizarre mashup of IT, The Exorcist and The Diving Bell and The Butterfly The Replacer is not for the faint of heart. The 1990’s. Tragedy strikes the Beharrell family in the form of a debilitating stroke. Now the youngest child in the family is convinced his paralyzed father didn’t truly fall ill but is possessed by something sinister. He believes a demon, THE REPLACER, has come to take away his jolly, agreeable, tech-obsessed Dad. But no one seems to see the monster — and with every passing day, his father falls deeper into the clutches of evil. 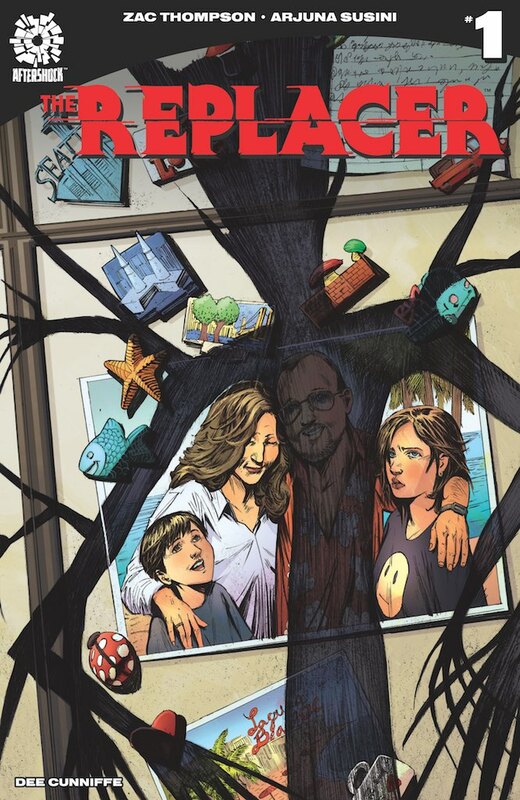 Based on Zac Thompson’s true story of coming to terms with a disabled parent, THE REPLACER is a complete 64-page graphic meditation on loss, tragedy and fear told through the eyes of a nine-year-old — a horror tale about learning to walk again, even if a demon has to teach you how to do it. A bizarre mashup of IT, The Exorcist and The Diving Bell and The Butterfly, with stunning visuals by Arjuna Susini (Made Men), THE REPLACER is not for the faint of heart.